Custom crayon coloring books are perfect to encourage kids to learn about your brand and new things through coloring. Coloring books and crayons make impressive gifts because kids love them immensely. If you are planning to host an event for kids, then it is best to impress them with any of these crayon coloring books. These promotional coloring books are budget-friendly and make perfect gifts during art class competitions, school functions, birthday parties and barbecue parties. Order from us today to receive attractive price benefits on bulk orders! Our product prices not only include the product but it keeps you covered for online design proof and artwork assistance, too. We offer 100% customer satisfaction guarantee and 110% lowest price match guarantee on all orders. Whatever business you are in, these promotional coloring books will give you promotional advantage over your nearest competitors. Do you know why? You are not only keeping kids entertained and amused but also trying to teach them values through inspiring stories and illustrations. Most parents love to associate with brands that take care of their kids. We are sure you will succeed in your efforts to attract those parents to your business. 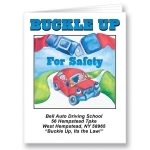 These promotional books will keep kids occupied at home, schools and during trips. Have you ever thought in this age of e-learning why we are stocking these traditional crayon coloring books? 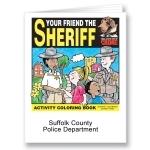 Well, for starters, these coloring books are low cost method of promoting schools, educational services, schools and variety of awareness events. If you consider these promotional coloring books from the parental standpoint, parents love gifts that keep their kids amused, entertained, occupied and informed. Families can enjoy some quality time with their kids like coloring with them and tell them their personal experiences with illustrations in these coloring books. Believe us, there is no other promotional gift as precious as a happy family time! 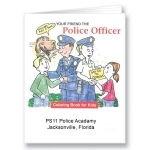 Custom printed crayon coloring books are popular with kids of all ages as well as businesses. Do you know why? 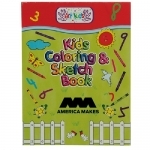 Kids can gain new information and experiences while coloring over these drawing books. These color books help kids to develop their creativity, motor skills and helps them to grow into responsible individuals. As you can see, our selection features custom printed coloring books in various themes ranging from animal welfare to importance of savings. Your selection will depend on the type of target audience you wish to address. For completeness, you can combine these crayon coloring books with any of our 2 pack, 3 pack, 4 pack or 6 pack crayons. You can team them with building block crayons (double learning experience) or swirl crayons (unique coloring experience). Call us at 855-454-3786 or write to us at info@promo4kids.com to know more about these custom printed coloring books or watercolor coloring books.